You spot this written at the back of all the trucks and tempos. The purpose behind it is very simple – if one wants to overtake that truck/tempo; they need to honk properly as an overtaking intention indicator! And the best thing was that for the first time I watched the match live and still Sachin managed to score and India won. Those regular here will know what I mean; and for the rest of you, click here. I had to mention this as this man has the power to create that stand still moment in the whole country. Back to my topic now; we take this Horn ok Please slogan way too seriously; for, most of the times you see those behind the wheels honking even when it is not required. We all are in hurry to reach at some place; and the traffic plays its part; but does the unnecessary honking really help? I don’t drive myself so I don’t know what must be going on in the mind of the driver; maybe he/she thinks that honking will help them move faster; or it will clear those hundred cars ahead of them the moment signal turns green; or maybe some fly button is installed somewhere at their car horns! Please help me with the valid logic. And those frustrated heads that come out of car windows after the hands attached to their torso are tired of honking; their efforts of making non-stop noise is futile thanks to the stand still traffic; they take out their head and shout their lungs out asking cars to move fast! If the jam is due to a broken car; then God bless the poor soul behind those wheels. For, he gets so many curses and abuses by those stranded because of him; but very few help him. Honking – a sign of getting late, an outcome of frustration or just a habit – it is for sure irritating for others if used consistently. But I guess no point in writing or blogging about it as we are not going to change. We will wake up tomorrow and start it all over again even in case of slow moving traffic in the silence zone; or our head will again pop out to abuse when we will see the cause of the jam. I actually get headaches cause of honking. I cant take high sounds and especially not that honking in traffic. I am happy happy happy... Sachin had made my day. i think it was a nice observation about honking... it is special to me since i'm totally a no-honking person i just move anonymously on the road.. other people have to remind me of the horn tho! Latest Blog Post: The GOD of all things! honk honk....now that really got me goin Neha,.... hwdy lng time no see! As I tour a lot I have find that within Mumbai honking is least. Re. : Sachin - I salute. And a message for ShahRukh Khan - Learn from Sachin. Speak by your performance instead of issues for publicity. A performance is publicity. And I salute Sachin again & again for the historical milestone. Love you Sachin. Ok. if you dont, i say 'please' ! :) Nowadays the level of honking is just not funny ! It causes so much of trouble to the ear and to the entire idea of peace ! Yes, Sachin has created history.We all need to send him msgs of congratulations.PM and PREZ did. Honking seems to be an expression of attitude of defiance, an expression of aggression and of course lack of civic sense. I can vouch for it that you are all better off in Mumbai(i have driven there),Delhi is worse when it comes to noise pollution.Why honk is a mystery I have not been able to solve. Mumbai is at least declared silence zone.In Delhi, even the area around the Parliament house is not so. 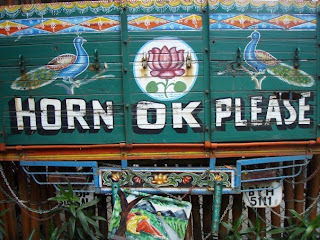 But,Horn Ok Please is a very popular sign on the trucks.It is said if a poet takes a drive on the highway, he could perhaps write lyrics of a complete song reading the slogans on the trucks. Coming to honking, people lack sense..Yes, they lack any basic sense. What help does it do when you honk at the vehicle ahead and the signal is red??? Honking in school zones, hospital zones... lack of civic sense. Those who honk unnecessarily are all impatient idiots. Honking is just a vent for people who can't get things their way, I think. People who are suppressed and depressed at home and work honk. Let's ask TISS to conduct a study on those lines. Sachin rocks as ever... I guess most of them know what Horn Ok Please means.. thts wht i tght.. hey u got a nice blog.. keep writing.. But driving from my house to lets say sector 17 in chandigarh, get to the lights , they are RED.. which otherwise means STOP.. and Wait but no way.. anyone who is behind you will HONK.. and HONK again..
and Sachin he is GOD in cricket.. kudos to him..
congrats to sachin...I was so happy to learn about his achievement kii I celebrated by eating chocolate mousse along with 'chak de' song playing in background. Ok now about the post...right people panic only when bell rings. We move only when the carwala honks the horn else we walk as though apne dad kaa rasta hain. Similarly, safety of citizens gained imp when 26/11 happened in Mumbai...till then strong security was unheard of. There r several instances...but enlisting them would eat up the comment space. Honking!! When you are on a red light and if a person takes more than a second to start the car i hear the honking and i will say, wait i am not going to build a house here..
honking unnecessarily is like barking...hehe..reg. sachin..i once argued he should retire..now he proved again that he is a gr888888 guy...sorry sachin..u keep rocking...and reg. neha..humko aapne bhhoott bana diya hahaha...come i will eat u up..
Nice post. Here in USA, horn is almost never used. Lot of people don't even know how to horn. No body understands this situation....that's nobody cares about the environment. Sachin is no more a human being....he is God !! Honking is a total no,no, for me! Well written article!